dance class | In the Ears.... Out the Hips! In the Ears…. Out the Hips! Thoughts on studying, performing and teaching the art of Middle Eastern dance. Learning how to shimmy is a huge challenge for many new belly dance students. Even if they come to Middle Eastern dance with several years of other dance training, most likely none of it prepared them for that small, repetitive movement that is so integral to belly dance styles. When they sigh “HOW do you do that so fast?”, we usually tell them “Practice, LOTS of practice!”. It’s true, practice makes perfect – or at least a lot better – but what exactly is happening in our bodies in that early shimmy learning stage? Remember back to your early days, instructors! New students, yes, we’ve all been where you are. You get your shimmy going and a few seconds later your knees mysteriously stop by no will of your conscious brain, You pause, then you start it back up again like an old car that stalled at a stop light. What is happening and how do you “fix” it? There are a few components to learning a new movement pattern. First, you brain needs to understand what you mean to do. Second, your brain needs to get your body to cooperate – at first in a slow and rudimentary way. In class, I ask my students if “their heads have it” meaning, they understand the movement. After all, your body doesn’t stand much of a chance if your brain doesn’t get it first. From that understanding, the body will learn it with enough perseverance. Princess Farhana cracked me up in a workshop once expressing the same idea. She said “your brain is writing checks your hips can’t cash” – so true! Now that your brain understands and your body can carry out the motion at a moderate speed for a short amount of time, how do we get that to grow into a sustained, smooth shimmy? This is where the body works the behind the scenes magic of neural adaptation. Whether it’s a shimmy or strength training, much of the early progress we see with practice is due to neural adaptation rather than actual changes in the strength or size of our muscles. For an Egyptian knee shimmy, the quadriceps and hamstrings are the primary muscle groups we are talking about. Each of these large groups in made up of several smaller muscles and each of these has bundles of muscle fibers that work together. 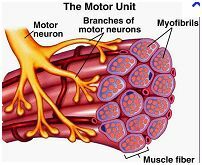 Each of these bundles is controlled by one nerve and that work group of muscle fibers and it’s nerve is called a motor unit. Check out the picture at the top of this post for an illustration of a motor unit. When the neural adaptation process starts, the brain and motor units improve the speed and efficiency of their communication. We experience this as our body “cooperating” with us. On a larger scale, the motor units learn to work together in a more synchronized way. Just like a rowing crew that has all its members in perfect timing to achieve maximum speed, your muscles work best when all the motor units needed contract in unison. As the movement pattern become more familiar to our brain, our bodies also begin to recruit more motor units to do the same movement which really adds more shimmy-power. We experience this golden moment as the “smooth, sustained shimmy”. So is your instructor conning you when she says “Practice, LOTS of practice!”? No, absolutely not. Neural adaptation is the outcome of all that practice. It doesn’t happen from thinking about your shimmy, or wishing your shimmy would get better. The more often you practice the more positively your neural network will adapt to comply with your dreams of amazing shimmies for hours on end. “Often” is the important key word here. Shorter daily shimmy practice will get the beginner better neural adaptation results that wrestling with it for an hour once a week. All of these things are also true for experienced dancers who are working to master a new and different shimmy than the one they’ve been doing for years. Every dance class and workshop should start with an effective warm-up. Our warm up helps us make the transition from resting to dancing. A proper warm up can reduce the risk of injury and even asthma attacks for those who are prone to exercise-induced asthma. About 5-10 minutes is all it takes to prepare our bodies to do our best in dance class. No matter what the activity, an effective warm up gets all the major muscle groups moving. Some instructors use dance isolations in the warm up, and while these can certainly work as part of the specific preparation for your style, larger, multi-joint movements that aren’t typical in belly dance are also important to really get the body prepared for the rest of class. As I’ve said so many times before in the DBQ, this is not the time for long static stretches. If an instructor leads the class in splits at the beginning of class, the only “splitting” you should do is out the door! Some instructors leave the students to warm up on their own before class, but I have never felt comfortable with this practice because the students often simply don’t know how. Even if they are familiar with good general warm up techniques, they don’t know what you specifically have planned for the lesson. This may include lots of shoulder, back or head movements that require extra attention to those areas of the body. In my classes, always tell my students what’s planned as we start and any specific thing we are doing to prepare our bodies to be ready for it. What exactly does a warm up do for our bodies? An effective warm up routine increases our heart rate and breathing, which brings more oxygen to our muscles so they can do more than sit at a desk or in a car, which is probably what they were doing before class. Getting all the major muscles moving increases the internal temperature of our body. That doesn’t mean we’re hot and sweaty already. Warm muscles are more receptive to movement, especially those that use a larger range of motion that our daily activities. Our joints get a lube-job. When our body gets the cues that we’re picking up the pace of our day, it adjusts the fluid in our joints for better functioning. This is important for everyone, but especially those with the remnants of old injuries, arthritis or tendinitis issues. On a less scientific level, I believe that the warm up is also a psychological transition from my students’ work day to their “me time”. It plugs their brain back into their body so they can focus on learning and the joy of moving. Those first 10 minutes of class set the stage for the rest of the hour. Get things off to a good start, either on your own or as the instructor. Now that you know all the good things that happen to your body in the first few minutes, make sure to get there on time so you don’t miss out!